Yes, it’s that time again! Time to get completely lost in the North Country’s #1 Fall family attraction – The MAiZE at Sherman Farm. 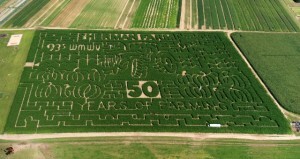 The MAiZE at Sherman Farm is opens this weekend through Sunday, October 26. 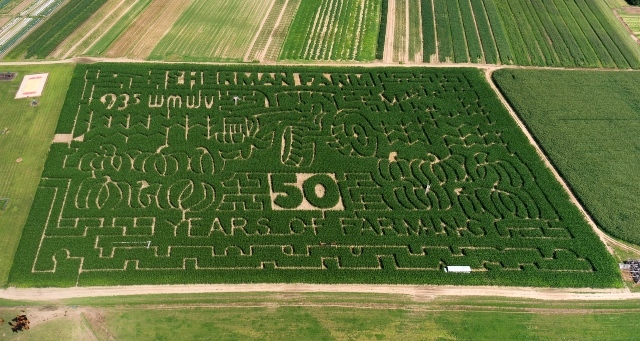 In their eighth season, the Sherman Family invites you to come celebrate 50 Years of Farming…12 acres of twists and turns with many special events throughout the season and proceeds benefitting Jen’s Friends Cancer Foundation and the Dempsey Center. What else can you do on the farm? Plan the entire day! There’s the Moo Express cow train, Corn Cannons, Hayrides to the Pumpkin Patch to pick your own pumpkins and gourds, a corn box (like a sandbox but filled with corn kernels), a picnic area, Al’s Animal Farm, a Kiddie Playground, a Jumping Pillow the Grain Train, and some of the best Fall comfort around in their concession area with the ‘ own farm raised hamburgers, hot dogs, pulled-pork sandwiches, apple cider donuts and kettle corn. And don’t forget Halloween is just around corner…a perfect time for the MAiZE Massacre! The MAiZE Massacre, presented by Conway Oral Health Care, Sherman Farms haunted maze is open on Friday and Saturday nights from October 3-November 1, 7pm-9pm, for ages 10 and above. For those who dare, can you find your way out before “Farmer Grimshaw” and the other murdered souls find you?!? The MAiZE at Sherman Farm is open Saturdays and Sundays from 10am-5pm September 27-October 13, including Columbus Day, and then 10am-4pm October 18-October 26. For more information on The MAiZE at Sherman Farm visit www.shermanfarmmh.com, call (603)455-5475, or visit them on location at 2679 East Conway Rd., Center Conway, NH.